SINCE 2014, Bangladesh has been commercially field testing four Btbrinjal varieties. In October 2013, on its last day of the session, the 9th parliament approved the genetically modified eggplants. The timing was strategic — a very agitated political situation prior to the national election was a convenient moment to introduce an inappropriate and unsafe technology. Btbrinjal has hardly any agronomic value but threatens Bangladesh with potential biosafety risks. Btbrinjal is the first GM vegetable crop that got the government approval despite protests from environmental and farmers’ organisations. Mahyco, the Indian counterpart of Monsanto, who gave the technology to Bangladesh Agricultural Research Institute, has now applied seeking approval for commercial release of Btbrinjal in India. India’s biotech regulator, the Genetic Engineering Appraisal Committee (GEAC) ,has sought information about Btbrinjal from Bangladesh. Now the question is what Bangladesh can say about Btbrinjal? Bangladesh experience demonstrated bad scientific practice and research ethiocs. In addition to that exposed blatant failure of Btbtinjal in the farmers’ field and the scandals of scientific lies. Btbrinjal is a genetically modified food crop in which Crystal gene from Bacillus thuringiensis has been inserted into brinjal genome to increase the resistance of brinjal against Fruit and Shoot Borer insect. Bangladesh Agricultural Research Institute received the seeds of Btbrinjal from Maharastra Hybrid Seed Company, India. No transfer of technolopgy or knowledge took place. The BARI had no role in it; it only used the Monsanto-Mahyco technology to conduct experiment with the Btbrinjal through the farmers in Bangladesh. 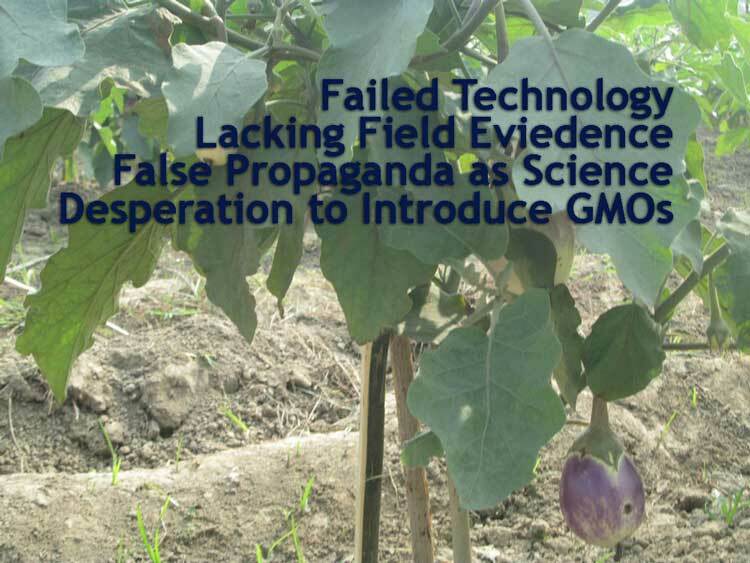 Bangladesh is merely an experimental field and BARI was used to bypass the scientific ethics and regulatory measures mandatory for field cultivation of a GMO; such by-passing was difficult in India and the Philippines. Therefore, this report is not done by any independent scientists from Bangladesh nor by any unbiased scientists from outside to justify the claims of success. Surprisingly, BARI website does not have any report of its own about the performance of Btbrinjal. Former director general of BARI, Dr Rafiqul Islam Mondol is now expressing his skepticism over the Btbrinjal performance and that it is free from pesticides. "One of the recent success stories has been the rapid adoption of Btbrinjal by Bangladeshi farmers. Brinjal, or eggplant (or begun), is an important culinary vegetable but has historically suffered from severe pest infestation and resulting in high rates of pesticide contamination. Since the Btbrinjal was deployed by Bangladesh Agricultural Research Institute, some 33,000 smallholder farmers—about 20 percent of the nation’s total brinjal farmers—have begun to grow the crop. Overall, they have reportedly experienced a 61 percent reduction in pesticide use and a six-fold increase in income" ('The goal of 'Zero-Hunger' in Bangladesh'. The Daily Star, October 16, 2018). Here he has arbitrarily increased the numbers of farmers ‘cultivating’ Btbrinjal to 33,000 and that 20 per cent of the nation’s brinjal farmers are cultivating Btbrinjal. This does not match with the figures given by the On-Farm Research Division of BARI. The government targeted farmers year wise for one season (OCT - March). Since 2014, the targeted figures are 20 farmers in 2014; 108 farmers in 2014-15; 250 farmers in 2015-16; 512 farmers in 2016 - 17; 5500 farmers in 2017 - 18. The total number of farmers so far can only be 6390. (Data is from the On-Farm Research Division, BARI, quoted in a slide presentation by the former Director General of BARI; see, Success Story on Bt Brinjal in Bangladesh by Md. Rafiqul Islam Mondal On BtBrinjal On-Farm Research Division, BARI, ). So the number of farmers 33,000 as is shown in his article is a blatant exaggerated lie. Besides the seeds distribution by BARI through the Department of Agricultural Extension to targeted number of farmers, there is no instance of farmers buying or receiving seeds from any other source. The distribution of seeds to farmers also does not guarantee that those farmers have been cultivating Btbrinjal. In the case of pesticide use, the reality was that the farmers had to use huge amount of pesticides recommended by the supervising authorities of BARI and DAE. These included Comfidor, Ektara, Admasar, Dithen M-45, Bavistin, Thiovit, Basudin, Furadan, Borax, Demsa granular, Vim powder, Admire, 200sl (Bayer crop science), Bleaching powder, Heckel, Salclox, Diazinon etc. There were many other insecticides and fungicide sprayed as provided by DAE. Thirty five types of pesticides including acaricide, insecticide and fungicide were sprayed several times in the Btbrinjal fields as per direction of the supervising officials ('UBINIG, 2015). So what is Bangladesh is going to say about the Btbrinjal? Should India follow the same unethical practice to coercively impose a failed technology having potential biological risks on the famers? Bangladesh has been at least successful in such effort!